This is a very useful feature, I think, so I'm reposting it. Anytime you can help people do something without actually have them do anything is great for them and great for you. However, getting users to use the templates is another step. For them, choosing File > New > Templates and Documents might not be something some will want to do or remember to do every time. What if one of the templates you've created is one that many or all users use all the time as the basis for new documents? You can make it come up when users just choose File > New > [type of document] by setting it as the default template. I.e. the user uses the template but doesn't even need to select it. First, create a new document and make it how you want it: create styles, apply styles, include canned text, whatever. Choose File > Templates > Save. Select a category and name the template. Click OK. Choose File > Templates > Organize. Open the category your template is in, in the left side. 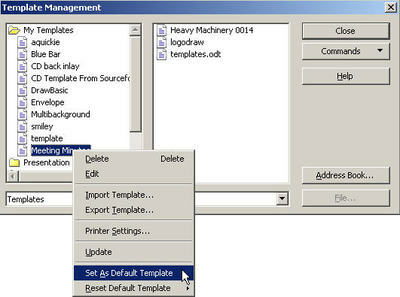 Right-click on the template and choose Set as Default Template. Click Close. You're done! Choose File > New > [type of document] and you'll see the effect. I'm afraid the Tools > Mail Merge Wizard has never been one of my favorites. Too complicated. I always train people to just "roll their own" when making a mail merge document. 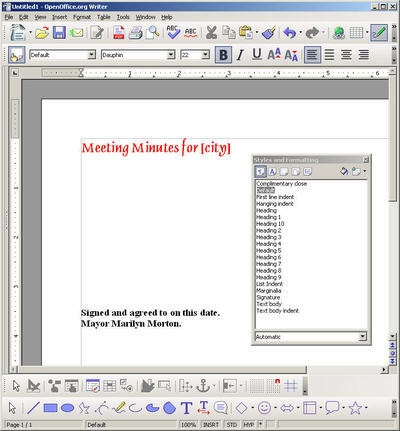 Everything you can do in the mail merge wizard, you can pretty much do in the roll-your-own approach, especially since you can now print all documents to a single file and then open that and customize it as you like, before printing on paper. One thing you can't do in the roll-your-own approach is do an email mail merge. Do you really want to go through the complexity and muscle aches of using the Mail Merge Wizard? No. And you don't have to. You're going to mix and match. Step 1. Create your email the way you want it with the roll-your-own approach. Save it. Keep it open. Step 2: Set up email configuration. 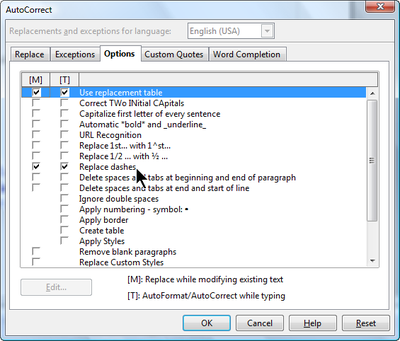 In Writer, choose Tools > Options > OpenOffice.org Writer > Email. This setup worked for me. Key settings are smtp.comcast.net and port 587. You just need to do this once. If you have security on your email, like requiring a password to send, you'll have to click the Server Authentication button and enter additional information. Step 3: Choose Tools > Mail Merge Wizard. Choose Current Document, or else browse to your document, and click Next. Choose Email and click Next. Select the database you're using and the table. Click OK and click Next. Keep clicking next til you're here. Fill it in by selecting the field from the database that has the emails in it, and anything else you want. Click Send Documents. You'll see the progress window (in this test I only sent two emails). The received email looks like this. Note that I sent it in email format, but with the extra carriage returns I put between the lines in Writer, it looks a little spacey here. You'll want to experiment with and adjust how you format the original Writer documents and what format you send in. You have a lot of control over how OpenOffice is set up. One of them is automatic formatting. I recommend turning off most of it. Here are two things to do that will make OOo work the way you want. Choose Tools > Autocorrect, Options tab, and unmark everything from the second line on down. This will prevent, among other things, the numbering formatting that starts when you don't expect it. I occasionally mention, in class, that you can apply styles with the keyboard too. However, I'm a menu user by nature so I usually forget to emphasize it enough. Here are the steps for setting up styles so you can apply them with a keyboard shortcut. Select the shortcut key to assign from the list of shortcut keys. Select Style from the Category list. Scroll down to the Styles entry and click the + sign to show the style types of OOo. Select the style to assign from the Function list. This is a "classic" post but important and useful. See also info on styles . A bunch of styles you need to have when you create a document. You are an excellent candidate for using templates. Templates are documents that store styles, text, graphics, general formatting—whatever you want. You create a document, save it as a template in the Template Place, then point to that template when you want to create a new document using what it's got. Put in it what you want in the template. Styles, graphics, text of every kind and variety. Whatever. Then choose File > Templates > Save. Specify My Templates unless you have another idea for a category. Type the name of your template like Meeting Minutes. Now you've got a template. You need to create a new document using that template. 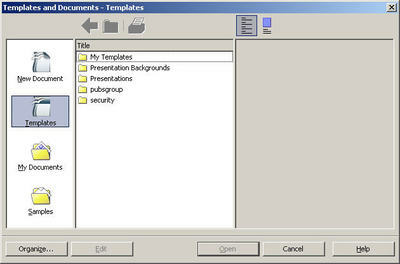 Choose File > New > Templates and Documents. Select the Template icon on the left. Open the category you chose like My Templates. You'll see your template. Click Open and you'll have a new untitled document based on that template. Choosing File > New > Templates and Documents is fine but what if that's your template you use all the time? You can make it come up when you just choose File > New > [type of document] by setting it as the default template. If you have a bunch of templates, Microsoft or OpenOffice.org, set up OpenOffice.org to know where they are. Then you can get to them as above by choosing File > New > Templates and Documents. First, if they're in Microsoft format, you need to convert them to OpenOffice format. Choose File > Wizards > Document Converter. Follow the wizard through to create a converted set of copies of the templates. Step 2, then just follow the wizard as prompted. Now, choose Tools > Options > OpenOffice.org > Paths. Select the Templates line. Click OK, and OK, and OK again. Now you'll see the templates when you choose File > New > Templates and Documents. I'm a big non-fan of word completion. But when you go under Tools > AutoCorrect in Calc to turn off word completion in Calc, as you would in Writer, there's no Word Completion tab. You need to choose Tools > Cell Contents > Autoinput to turn it off, or turn it on again later. I really thought that I had posted this article, but I have not seen it in a quick page through. It is a big, big article with most of what I recommend about setting up and switching, with the primary focus on individual users. But it applies to transitioning groups, as well. See also this blog post, which has some really specific info about how to distribute clip art to many users on a network. This is huge. Thanks to TerryJ on the [email protected] alias for pointing the way. So you're an IT director. You want to make things easy for your users (and thus easy for your team so they need to answer fewer questions). 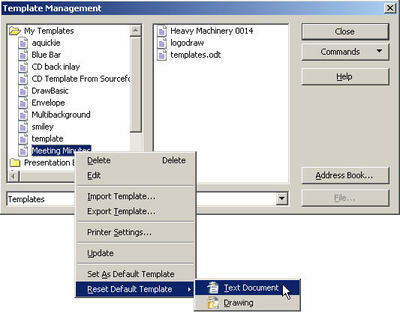 One way to make things very easy and simple for your users is to create templates. Create a template that has a watermark background like Confidential. Create a template that has whatever characteristics are needed for a department's tasks. Now, you could create a template and just set it as the default template so that users get that template when they choose File > New. But if you have multiple documents they need to make, you probably don't want to do that. Or you can do that, but you have more than one template you want to offer. You could just put your templates in a nice centralized location for your users. However, some users don't view it as all that convenient or obvious to choose File > New > Templates and Documents, the pick the right category and the right template. Here's how to make it easy, and thus likely, for users to use the templates you provide for them, and thus for them to not even enounter problems, or encounter tasks that are harder than they need to be. Make a menu and attach templates to menu items on that menu. Now, this means more up-front work for you, but then it's done. A) Make your templates and put them in a central network location. Be sure they're in template format, not document format. B. Create a new menu. Choose Tools > Customize, click the Menu tab, click New, then name it and click OK.
C. Now you just need to add menu items that point to the templates. 1. Choose Tools > Macros > Organize Macros > OpenOffice.org Basic. 2. This window will appear. The macro I already created is listed there. In this example I'll create another one that does the same thing. 3. In the Macro Name field, type the macro name like OpenTemplate. 5. What you now see in the macro editing area will depend on what was there last. I'm not incredibly familiar with the macro window but I know that what I did worked ;> so you should be able to follow these directions successfully. and put your macro in the middle. Leave all the other macros that are there. 6. Now you want to write the following macro. There are variations here but this is what I did that worked. I show an example first, then syntax. 7. Click the Save icon and close the macro. 8. If you choose Tools > Macros > Organize Macros > OpenOffice.org Basic again, you'll see the macro name. Here the original one I wrote and the one I added for this example are both shown. Close the window, then choose Tools > Customize, and in the Menus tab, select the menu you created. 11. In the window that appears, expand the Macros category at the bottom, and select the macro you wrote. 14. Select the item, click and hold down on Modify. 15. In the window that appears, rename the item however you like and click OK.
16. Click OK in the Customize window. 17. Now choose the menu and the menu item. 18. The document you created appears. If you created it in template format, then it will be an untitled copy of the document. D. Copy the configuration to other computers. 1. Copy the macro to the same location on other computers. 2. Copy the configuration file where the menu and menu items are stored to the same location on other computers. It's called menubar.xml; there are several depending on what the menu is for. Here's where it is on Windows for a Writer menu; for Calc it would be scalc\menubar\menubar.xml, and so on. Here's what the content looks like in the menubar.xml file. See this link for the original explanation. An em dash is the nice long one that you insert between thoughts. How does it work? It takes two regular hyphens that you type using the keyboard and turns'em into an em dash. So you type this, using the - key that for me is to the right of the zero and left of the = and +. but then when you press the spacebar, the substitution happens. At this point you can copy and paste the em dash anywhere you want, or just keep using the -- approach. you'll want to use the Replacement tab of the same window. I cover that info as well as another approach to longer-text shortcuts here, but here's the basic set of steps. 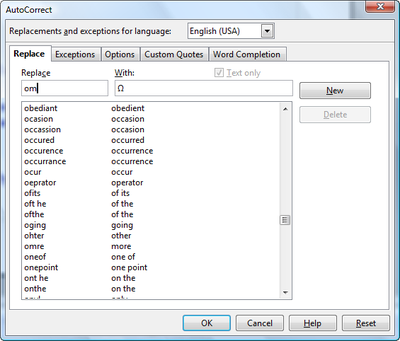 NOTE: If you want to insert the Em dash using the Special Characters window, with or without the corresponding shortcut, you can find it in the General Punctuation section of the Special Characters window. 1. 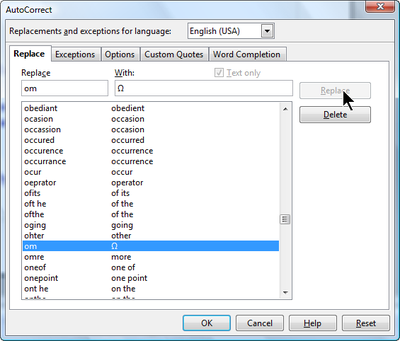 Choose Insert > Special Characters and find the symbol you want. This can take a while since there are a zillion but scroll around, change the selections in the dropdown lists at the top, and you'll find what you want. Select it in the window and click OK.
2. The symbol will appear in your Writer document. Select it and copy it. 3. Choose Tools > AutoCorrect and click the Replace tab. 4. In the left field type one or more letters that are NOT a word (i.e. you won't be typing them on their own to appear as is) and in the right field paste the symbol. 5. Click New. (The New button will then change to display the word "Replace".) The substitution will appear in the list. followed by a space. When you type the space, the substitution will happen. If it doesn't happen, choose Tools > AutoCorrect, Options tab and be sure that the Use Replacement Table option at the top of the list is marked, with both checkboxes. If it's not, mark both checkboxes and click OK. Then type your shortcut again and a space, and the substitution will work. There's a nice little extension for OpenOffice.org that lets you quickly upload your document to your googledocs account. Click here to get it. Installing the extension gives you this toolbar, as well as a Google Docs menu. Click it to get this window; just enter the appropriate information. 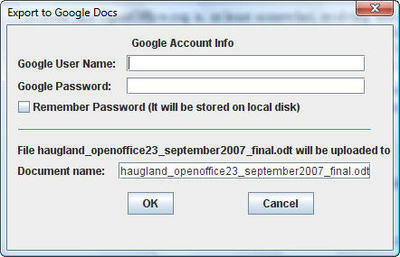 Your document will be automatically uploaded to your account in Google. It works pretty nicely. Installing extensions is pretty easy. Download the extension. Then choose Tools > Extension Manager. Select My Extensions and click Add. 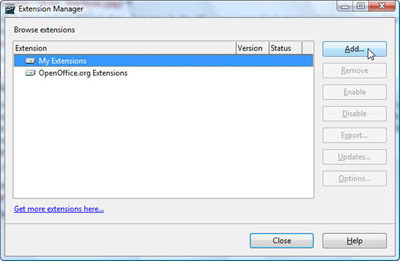 Find the extension file you downloaded, an installation process runs, and you’ll see Enabled next to the extension. For some extensions, you’ll need to restart. Look for a new menu, new menu items, new toolbars, or all three.